Russian knapweed is a deep-rooted perennial plant that can grow up to 3 feet tall. It reproduces by seeds and from aggressive underground stems and roots. Rosette leaves are lobed and have wavy margins; they are blue-green in color and covered with fine hairs that give the appearance of a fine white powder. Most plants produce a single branched stem that is covered with fine gray hairs. The leaves are about 1 inch long, relatively narrow, linear, and arranged alternately along the stem. Each branch produces one to three flowerheads that are about ¼ inch in diameter and have papery bracts. The flowers are pink to purple. Ten to 15 seeds are produced in each flowerhead. Type and Class of Livestock: Sheep (particularly dry ewes) and all classes of goats. Grazing Objective: Removal of 80% of biomass. Growth Stage for Treatment: Early vegetative to flowering. Livestock will consume Russian knapweed reluctantly. It is unpalatable to cattle though it may be occasionally eaten. Patches should be grazed at least three times per season, allowing 8 to 10 inches of regrowth between treatments. Three or more years of successive grazing treatments will be necessary to suppress populations. 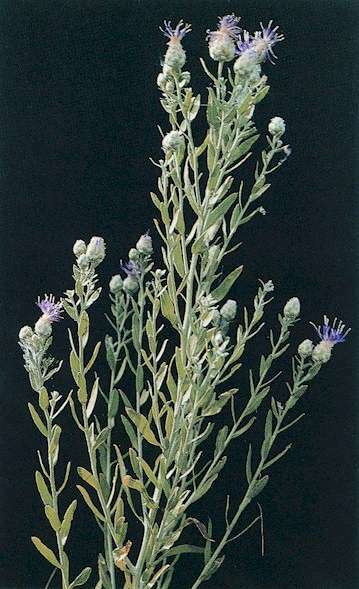 Potential Effectiveness: Most of the literature indicates that livestock will not eat Russian knapweed because of its bitter taste. However, survey respondents indicated that under certain conditions sheep and goats will graze Russian knapweed, especially when the plants are young and after the animals have grazing experience. To be effective, grazing must be repeated multiple times each season and for several years. Grazing Russian knapweed may result in reduced biomass and density of plants, but populations may return to pre-grazing density when grazing ceases. Long-term management of Russian knapweed will require an integrated program including herbicides and competitive plantings. Graham, J. and W.S. Johnson. 2004. Managing Russian knapweed. University of Nevada Cooperative Extension. Fact Sheet FS-04-37. 4p. Integrated Pest Management Practitioners Association (IPMPA). 2000. Spotted, diffuse and Russian knapweed. IVM Technical Bulletin. Available at: http://www.efn.org/~ipmpa/Noxknapw.html. Accessed 03 September 2006. Kettle, R.M. and R.E. Wilson. 1998. Management of Russian knapweed in Nevada. University of Nevada Cooperative Extension. Special Publication SP 98-09. 16p. Schultz, B. 2005. Identification, biology, habitat, and control of noxious weeds in Humboldt County and adjacent areas of northern Nevada: An introductory handbook. University of Nevada Cooperative Extension. Special Publication 05-18. 49 p.